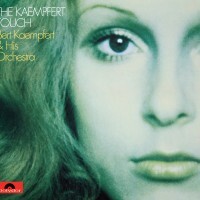 The “Kaempfert Touch” – this term stands for that “certain something” with which Bert Kaempfert laced his music: attractive melodies, elaborate arrangements combining various instruments to produce a soft and gentle sound, the chorus treated in an orchestral manner, mellow trumpets or other solo instruments, a unique rhythm – and all that conducted by a man who knows how to get his musicians to play in a very special and distinctive manner. This special “touch” is not only found in compositions by the Kaempfert/Rehbein team, but is also used to enhance works by other composers, as is admirably demonstrated by the album THE KAEMPFERT TOUCH, recorded in October 1969 in Hamburg and released at the beginning of 1970. Alongside original Kaempfert/Rehbein numbers such as the dramatic We Can Make It, Girl (which was performed by Malcolm Roberts among others), the truly swinging Headin’ Home, the romantic waltz One Day With You or the lively bossa nova All For You, there is a wealth of hits and mega-hits from 1969: Something, which Frank Sinatra regarded as “the greatest love song of the past 50 years”, is taken from the Beatles album “Abbey Road” (then brand new), for which the Fab Four received a gold disc; Shirley Bassey’s version also landed in the hit parades at the time. Today this song is available in over 150 cover versions – and Bert Kaempfert’s is one of them. Didn’t We was written by Jim Webb, the composer of pop classics such as Up, Up And Away and By The Time I Get To Phoenix. It was a further success for the actor Richard Harris, who had discovered his musical talents in the role of King Arthur in the film version of the musical “Camelot”; Webb’s melodramatic MacArthur Park had been a previous hit for the actor. America’s most successful female group of all time, the Supremes, shot yet again to the top of the charts with Someday We’ll Be Together; Diana Ross, the lead singer, took her leave of the soul trio with this song to start an extremely successful solo career. Alongside such illustrious pop songs, illustrious film melodies must take their rightful place, and so two such numbers – rivals for an Oscar in 1969 – can also be heard here. While Rod McKuen’s Jean from the film “The Prime of Miss Jean Brodie” had to be satisfied with the honor of being nominated, Burt Bacharach’s Raindrops Keep Fallin’ On My Head from “Butch Cassidy And The Sundance Kid”, filmed with Paul Newman and Robert Redford and a success all the world over, was awarded the coveted trophy. B. J. Thomas’s vocal version stormed to the top of the charts and was one of the greatest successes of the year, bringing him a gold disc. The number has since firmly established itself as one of the best known evergreens. Bert Kaempfert’s sound engineer Peter Klemt was awarded a diploma by the National Academy of Recording Arts and Sciences for the nomination of the album THE KAEMPFERT TOUCH as “Best Engineered Recording (Non-Classical)”, a further testimony to the internationally recognized high quality of Kaempfert recordings.